Are you a world-class developer or do you have what it takes to become one? If so, consider applying. The Andela Fellowship is a highly-selective, 4-year, paid professional opportunity to work with some of the world’s leading technology companies. Two percent of applicants are invited to participate in a free, two-week-long Boot Camp led by senior developers educated at some of the world’s top engineering schools. Andela Boot Camps are some of the most rigorous training experiences in the world. At the end of each Boot Camp, top performers – typically, fewer than one percent of applicants – are extended job offers as full-time Andela Fellows. The Andela Fellowship is a new kind of academic experience. It’s sort of like a university, except instead of paying tuition, you’re earning an income. The initial months of an Andela Fellowship involve immersion training in full-stack (front-end and back-end) development skills. After 1,000 hours of instruction, we’ll place you on client projects as you continue training to ensure you are equipped to meet the evolving needs of the industry. This is a free two-week-long training where you will gain valuable programming skills. When it’s over, the highest-performing participants will receive job offers to join Andela full-time as Andela Fellows. Immersion Training (3 months): Nov 3, 2014 – Feb 3, 2015During a three-month-long immersion training program, Andela Fellows will receive a monthly stipend. After three months of training, you’ll be qualified to work on client projects with top technology companies. Full-Time Employment: At the end of Immersion Training, employees will be eligible for continued training and employment with Andela. Bring your talent, passion and aspiration to Accenture. Build an extraordinary career as you work with inspiring leaders and some of the brightest people in the business to help target and deliver tangible value to global businesses and governments. At Accenture, you will turn theory into action, and issues and opportunities into outcomes. This means you will have the opportunity to see your work come to life while honing your strategic and operational skills. Choose Accenture, and make delivering innovative work part of your extraordinary career. Join our Internship Program and gain hands-on experience in a variety of fields as you develop essential core skills in our Business Functions (Consulting, Enterprise & Services). As a member of the Consulting team, you will have the opportunity to work with leading business and government organizations to address some of their most significant challenges. Together with talented and diverse colleagues, you could be involved in the analysis and development of transformational business models, through to helping clients integrate and operate them. In addition to this, you will also get the opportunity to develop strong leadership, problem solving and people management skills. You will be engaged on a 2 to 6-months’ placement depending on the period of your internship. You will undergo orientation and will also be given the opportunity to learn on the job thus gaining a thorough understanding and experience of what a career in consulting means and what it is like to work with Accenture. Much of the work we do is at the cutting edge of innovation and thinking; our teams publish and share this knowledge as thought leadership to benefit clients, industry and fellow colleagues. Having a message is one thing; being able to deliver it effectively to an audience is another. 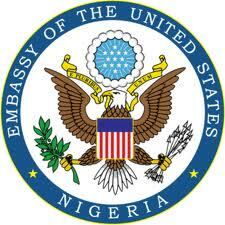 The U.S. Consulate General, Lagos is offering free empowerment training on public speaking and presentation skills to upwardly mobile women who want to make a difference in their communities and nation as a whole. The training format will be practical, fun and inspiring and will demystify the myth of public speaking and giving presentations. It will be taught by several trainers and topics to be covered include: leadership & goal setting, communication skills, building confidence, using audio visuals, researching your topic etc. The main aim is to enable the participants advance professionally and personally. All participants will have to prepare a 5 minute speech to be delivered in front of your peers on the 2nd day of the training. The topic should be Women in Leadership but you can approach it from any angle. APPLICATION DEADLINE: Friday, January 11th, 2013. CYFI is pleased to announce that YECA, the youth entrepreneurship training academy designed by CYFI’s Vocational Training team, is now in the final days of accepting applications. 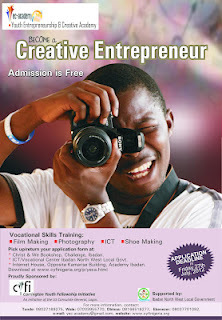 Motivated youth in the Ibadan area are encouraged to apply! The YECA program will be run and coordinated by CYFI’s Vocational Training fellows, and feature practical training and hands-on interaction in the areas of film making, photography, ICT, and shoemaking. Participants will learn useful skills, and have a chance to complete an apprenticeship and showcase their wares. Please click HERE for the YECA application form. Email yec.academy@gmail.com with any questions. Community Conservation and Development Initiatives (CCDI), a partner organisation of Heinrich Böll Foundation, has been working with local government officials and community members in three local governments (Yaba, Eti-Osa and Lekki) to raise awareness on causes and consequences of climate change within their local communities and build capacity for identifying/formulating action plans to respond to the most urgent needs. 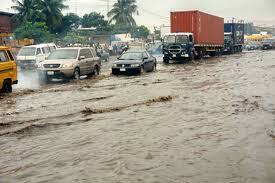 The recent weather disasters in Lagos have indicated that the new rainy season might cause more havoc to life and property than ever before. To prevent the worst scenarios or to alleviate the suffering of affected people, quick and decisive action from the part of the responsible government officials would be necessary. Meanwhile, the experiences of the project have shown that local governments have difficulties in taking swift actions because of bureaucratic and financial bottlenecks.. In order to hold the local governments more accountable and to ensure the implementation of the proposed projects, young volunteers from the communities are required to support the project by reporting and monitoring project activities and other incidents relating to the topic through blogs, tweets and facebook posts. The aim is to increase dialogue around climate change issues at local level and to monitor and probe the performance of their local government representatives in this regard.This social media-enabled project activity will also increase the political involvement of interested young people and create awareness about climate change and local response initiatives. Call for Volunteers The project seeks to recruit and train volunteers (4 for Yaba, 3 each for Eti-Osa and Lekki) who will work in close cooperation with CCDI and the project consultant. Selected volunteers will receive training that will introduce them to CCDI’s project on climate change and local response initiatives, the importance of Social Media for transparency and accountability, the role of volunteers as watchdogs, and detailed expectations of their contributions. The project consultant will monitor the performance of social media volunteers and hold regular meetings with the volunteers. Volunteers are expected to post frequent blogs and use other social media channels to promote the blogs and encourage feedback/interactivity. The volunteers are also expected to attend CCDI meetings and carry out their own independent research on local climate change and environmental issues depending on individual interests. This is a volunteer role but it can serve as an opportunity for anyone looking for unpaid internships or an opportunity to work on a project with an international foundation and a Nigerian non-profit working on local response initiatives to climate change. To cover the cost of transportation, a nominal monthly stipend will be provided. Residents of Yaba, Eti-Osa and Lekki who are interested in using social media tools to support local response initiatives to climate change and can devote some time towards blogging, tweets, facebook updates and physical meetings between April and October 2012 should send their CV and a Statement of Interest to gbenga.sesan[at]pinigeria.org before 5pm on March 15, 2012. In the context of the foundation’s primary work in advancing effective institutions and building transparent governance, the Program Officer will develop and manage a portfolio of grants and related activities focused on advancing public service media in West Africa. 3). Innovatively stimulate the creation and wide dissemination of high-quality, independent, diverse, appropriate and targeted content that supports and deepens the impact of these two initiatives; and 4). Build strategic communications and investigative journalism skills, tools and practices of development stakeholders. The principle focus of the grant making is to encourage the development of content and institutions that contribute to the effective engagement and impact of the field office strategy. This could include support for long and short film production, radio programming, (citizen) journalism, and the use of mobile phones and web-based media as essential tools in the office’s social change strategies, or the development of distribution platforms and print or online destinations to serve as hubs of social justice content. The goal is to increase awareness, foster public debate and dialogue, promote learning, enhance public access and contribution to targeted campaigns, and assist in the emergence of an independent, journalistic and storytelling community committed to social justice content. Working as part of the West Africa Program Team, the Program Officer is expected to identify potential grantees (governmental and non-governmental), solicit, review and respond to proposals, recommend and monitor grants and evaluate programming; and offer support and guidance as needed to actual and potential grantees. S/he should develop and maintain close working relationships with existing and potential grantees and with leaders in governments, the media, research institutions, civil society and other funding agencies. The Program Officer’s work will contribute to the office’s wider goals and as such s/he will work collaboratively and in tandem with other Lagos-based Program Officers. S/he will also collaborate with colleagues in New York and other Foundation officers to support regional and global networks and initiatives. Substantive knowledge of the media field in West Africa and its potential in driving social change at scale. A good understanding of the role, power, and likely impact of digital innovation and social media in the emerging new media landscape, particularly in emerging markets such as Nigeria/West Africa. Appropriate educational background, including an advanced degree in journalism, media and development, the social sciences and/or public policy. Significant professional experience working to advance development/social change through diverse platforms in the media, public or non-governmental sectors. Excellent written and oral communication skills. Fluency in French an added advantage. Ability to conceptualize program ideas and strategies and translate them into practice. Demonstrated analytical and organizational skills. Strong interpersonal skills and ability to work with colleagues of diverse backgrounds and perspectives. is based on experience and on the Foundation’s commitment to internal equity. A generous benefits package is provided. This location is based in Lagos, Nigeria. Technology can transform the way companies interact with their customers, and the Direct Sales Organization helps the world’s biggest companies to do just that. Whether we’re working with corporations directly or partnering with advertising agencies, we create innovative advertising campaigns across a variety of our products. Our Sales teams of account managers, executives, strategists, coordinators and specialists are specialized in different industries and regions to ensure that our ads reach the right users and give our clients the most bang for their buck. As a Google Program Intern, you will support our team’s deployment of new and exciting Google products targeted at the region’s user and small businesses. Armed with deep knowledge of Google products and user needs, you will conduct market research and undertake various projects aimed at improving our current and future product offerings. Such projects might include user surveys, product testing, outreach to publishers and businesses, or marketing support. You may work with various teams across our product range and should expect a high amount of responsibility, on par with a regular team member. You come to us with a sharp, analytical mind and an entrepreneurial spirit, and you’re eager to join an exuberant, fast-paced team environment. Internship will start on January 16, 2012 and will run approximately 14 weeks. Please apply with a full CV in English and university transcripts or a full grade summary. Take full responsibility for projects as assigned and develop smart, integrated, research-based marketing proposals for internal use. Research and develop deep knowledge of key markets, and the respective competitive landscape, client products and key business issues. Utilise measurement tools to add relevant data to presentations and proposals. Contribute to the development of internal and external products. Troubleshoot user and small business issues. University degree or equivalent in progress. Experience and ability in common business applications (word processing, spreadsheets, presentation) and internet savvy. Previous sales support or market research experience or internships. Superior analytical skills and problem-solving abilities. Are you looking for an adventure? Google now offers internship opportunities throughout the year. If you are studying Psychology or Art History, don’t let that arts degree keep you from applying to Google. We have internship work in many non-technical fields – including Finance, Marketing, and Sales.